We provide 5 year warranty for the PRE CONSTRUCTION ANTI TERMITE TREATMENT done by us. 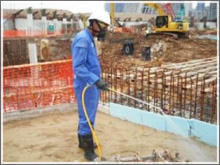 At Chem-Pest we throughly inspect the soil and surroundings before the start of the construction of any building. The way in which buildings / homes are built impacts on the likelyhood of termite invasion. 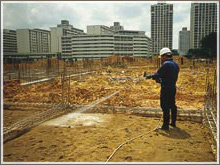 During construction we often create conditions which are conducive to termite or may allow them to enter the building. There are number of steps we take to reduce the termite problems. Liquid treatments are applied to the soil to form a continious chemical barrier in the soil around both sides of the foundation. This barrier prevents termites from reaching the foundation and, ultimately, the wood in the building. A properly-done soil treatment is not a one time application. It is done in stages coordinated with all building activities from foundation construction through final grading of the soil around building exterior. In order for the treatment to be effective the final phase of the application is done after final grading and even landscaping is completed so that the treatment of soil is not disturbed. Termites usually invade buildings by way of the foundation either by crawling up the exterior surface where their activity is usually obvious or by travelling inside masonary. We need to block their access points on or through the foundation. We use odorless and colourless termiticides to form a barrier against termites. Our method is quick and completely safe.